Warren Bonifacio drives past Carlos Lopena. 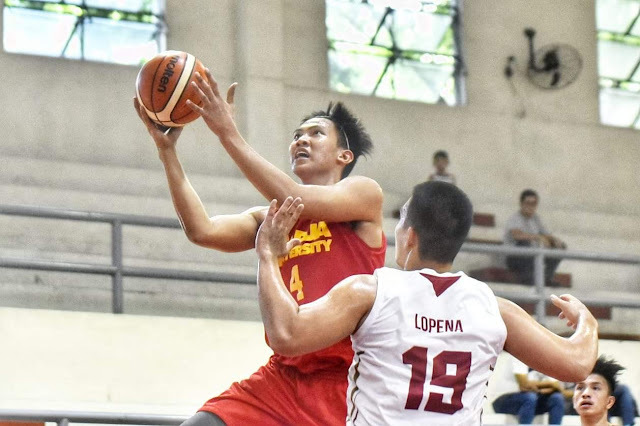 MANILA--The Mapua University Cardinals used a second quarter run to pull away and beat the Treston International College Golden Lions, 90-72 in the latest game day of the 25th Fr. Martin’s Cup Summer Tournament Friday at the San Beda University Gym. But a strong close out from Mapua sealed the win. Bonifacio topped all scorers with 16 points while guard Adrian Nocum contributed 15 markers. Buñag accounted for 14. In the second affair, the Treston Golden Cubs avenged their seniors counterparts by blowing out the San Beda Manila Red Cubs in Group A of the Juniors division, 93-74 behind 14 points from Ronel Ulep. Speedy point guard Rasheen Jose backstopped Ulep with 10 points while setting up his teammates for most stretches of the game. Art Cagandahan chipped in 12 markers.